Welcome to another edition of the Wednesday coffee klatch, where I discuss and create recipes inspired Gilmore Girls. Last time I talked about A Year in the Life, episode one (Winter), and today I'm talking, unsurprisingly, about episode two (Spring). So, without further ado, here are my thoughts. I'd love to hear what you thought about this episode in the comments below. Yay, Mrs. Kim! I love Mrs. Kim. And apparently, there's a Mr. Kim. I didn't realize that Lane's dad was "around". Was he in Korea during the original 7 seasons? 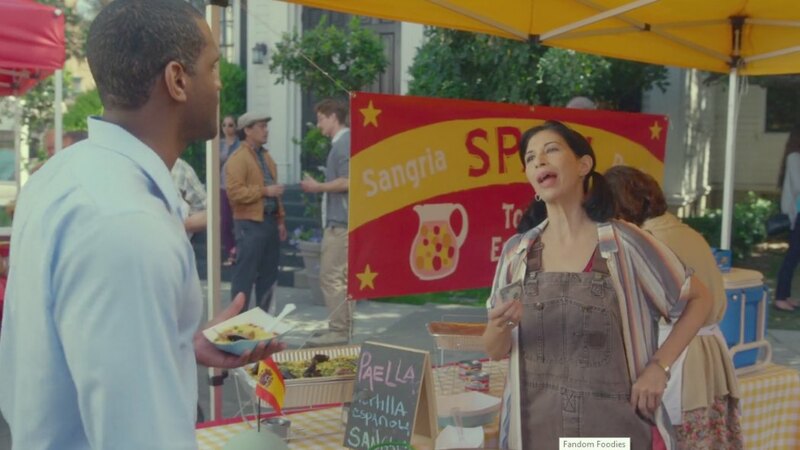 Gypsy is running Spain, featuring Sangria, Paella, Tortilla Española, when Taylor walks up and says "Gypsy, whip up a quick poutine. You're taking over Canada." Basket bidding>much to Cassie's chagrin, Lorelai bids on (and wins) her basket. 12:00 Mitchum Huntzberger makes an appearance when Rory and Logan are "innocently" eating lunch together. Liz and TJ join a vegetable cult. Ha ha ha! Kirk reminds everybody that they're not supposed to bring food purchased outside theater into the theater. Each person proceeds to pull out food, including: Chinese, burger and fries, whole chocolate cake, bucket of fried chicken. Oh, and this is while they're all at the theater (aka Black, White and Red Movie Theater), Kirk debuts his second movie. And then we had to watch it. Another 3 minutes wasted. Although his Eraser Head hair sort of made up for it. This episode's "guest chef" is Rachael Ray. Delish soup and sammies. Rory and Paris back at the high school. Appearances from Principal Charleston, Tristan (but not ACTUALLY Tristan, so why bother? ), and Francie. Cronuts...and the new Cronuts (cro-dough-cakes). Pastry. Hot dogs. Okay, so Rory had a one-night stand with a wookie. Ummm, what in the actual eff? Cheating on Paul not only with Logan, but with a rando. Oh, Rory. 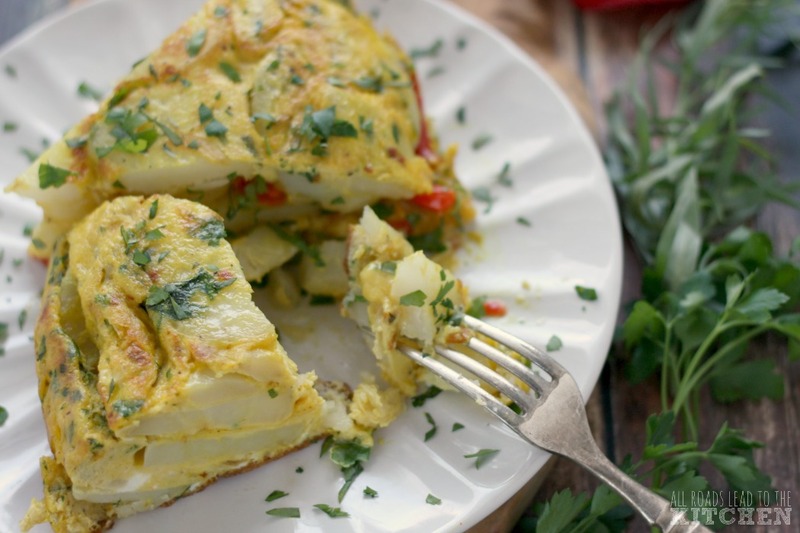 This week's recipe was inspired by the Stars Hollow International Food Festival, specifically one of the offerings at the "SPAIN" table, run by Gypsy—Tortilla Española. If you'd like some Sangria to wash it down (like Gypsy was offering), I recommend this Rock and Roll Sangria or this Beer Fruit Cocktail Sangria! See you next time for Gilmore Girls: A Year in the Life (S1:E3 "Summer")! 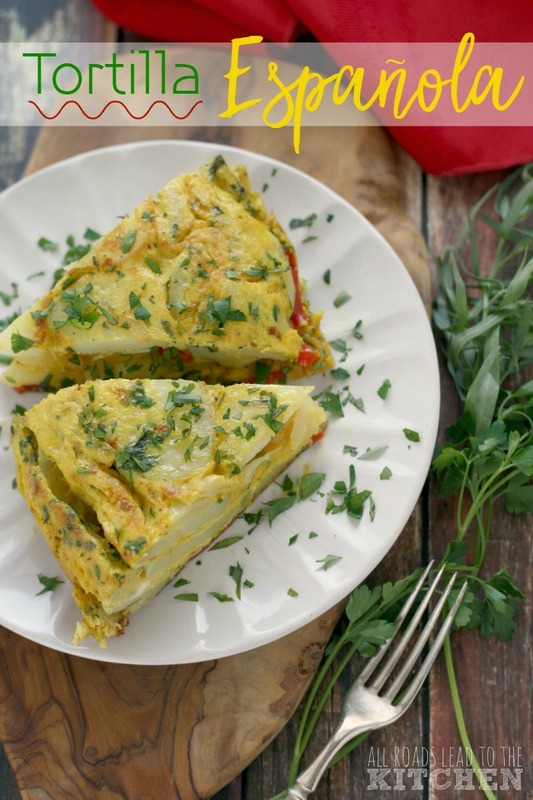 Also known as tortilla de patatas, this traditional Spanish tapa also makes a delicious meal any time of the day. Simmer potatoes in lightly salted water until just tender, taking care not to cook so long that they fall apart, 8-10 minutes. Gently pour into a colander and let sit until needed. Heat a 10" nonstick skillet over medium heat. Add half of the butter, once melted, add onion and bell pepper. Cook until the veggies are just tender and starting to golden in spots, 6 minutes; add garlic and turmeric and cook for another minute, stirring constantly. Scrape mixture onto a plate and allow to cool slightly. Beat the eggs and cream in a large bowl. Stir in herbs and a couple big pinches of salt and pepper. Gently fold in the reserved cooked veggies and potatoes. Set skillet back over low heat and add butter. Once melted, pour in the entire mixture. Press down any potatoes that are sticking up, so that they are under the eggs. Cover and cook (still over low heat) for 12-15 minutes. If the top isn't quite set, very carefully slide it onto a large plate, then invert the pan over it and quickly and carefully turn. Return to heat, uncovered for 2-3 more minutes, or until set. Slide onto serving plate and let cool to room temperature. 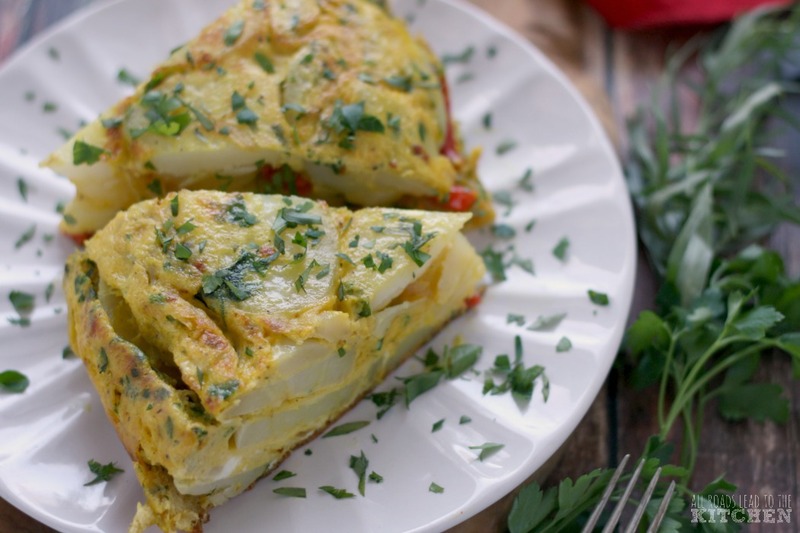 Sprinkle with more fresh herbs, if you wish, cut into 8-10 wedges and serve.